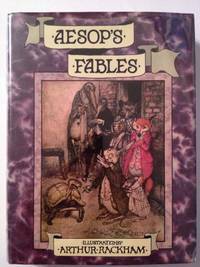 Sardonic, wry and wise, Aesop's Fables are some of the most enduring and well-loved literary creations in history. In a series of pithy, amusing vignettes, Aesop created a vivid cast of characters to demonstrate different aspects of human nature. Here we see a wily fox outwitted by a quick-thinking cicada, a tortoise triumphing over a self-confident hare and a fable-teller named Aesop silencing those who mock him. Each jewel-like fable provides a warning about the consequences of wrong-doing, as well as offering a glimpse into the everyday lives of Ancient Greeks. London: William Heinemann Ltd, 1969. Ex library book with usual marks and stamps. Fingermarks and other marks generally and stain to one page - most pages clean. No creasing to covers or to spine. Old tape marks around top of spine and end papers and both spine ends torn. Soiled page edges. 224pp. Introduction by GK Chesterton. Coloured plates and drawings by Arthur Rackham.. Hard Cover. Poor/No Jacket. 8.25 x 6 inches. Heinemann Young Books. Hardcover. 0434958557 ref 130 d . Very Good. 1931. London: William Heinemann, 1979. First Published in 1912; seventeenth printing of the original. Purple cloth boards, silver spine titles and cover design, light shelf wear. Pages near fine. Illustrated endpapers. Bind good; hinges intact. Dust wrapper moderate edge shelf wear; protected in new clear sleeve. One dozen richly colored plates by Arthur Rackham with many more black and white illustrations in immaculate detail throughout. Superbly decorated with over sixty of Arthur Rackahm's illustrations and an introduction by G. K. Chesterton. Printed and bound in Great Britain by Morrison and Gibb Ltd., London and Edinburgh. 224 pages. Insured post.. First Edition. Hard Cover. Fine/Fine. Illus. by Rackham, Arthur. 8vo - over 7¾ - 9¾" Tall.